WATERCOLORS OF THE WORLD presents a dazzling array of images by San Francisco artist Raymond Martinez. 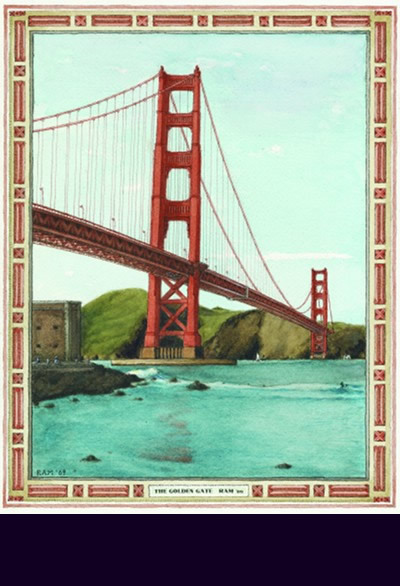 His iconic images of San Francisco include views of the Golden Gate Bridge, San Francisco Bay, Lombard Street, Golden Gate Park, Cable Cars on Nob Hill, Coit Tower, and the San Francisco Opera. European scenes feature Westminster Abbey in London, The Eiffel Tower, Paris, and the Spanish Steps in Rome. You will also find views of the Chrysler Building in New York, Yosemite Valley, various floral paintings and four unique Christmas cards.